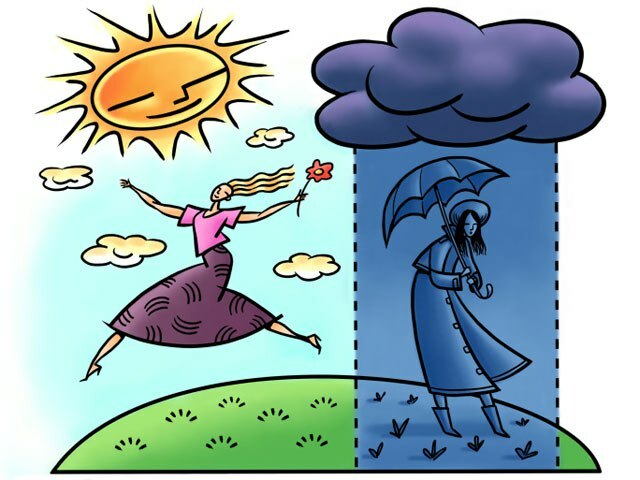 Research on Seasonal Affective Disorder began in 1979 by Herb Kern. He did this because he was curious about why he felt depressed in the winter months. The first use of the term Seasonal Affective Disorder was back in 1984 in a paper by Norman Rosenthal. The paper talked about the cause and how circadian rhythm can affect the role of melatonin. SAD was not recognized until 1993 when he published his book “Winter Blues”. Roughly 6 percent of people in the United States suffer from SAD with another 10 to 20 percent who suffer from a mild form of SAD. This disorder is more common in women than in men and for individuals who live in northern climates. Onset typically occurs between the ages of 20 and 30. Those who have relatives who suffer from SAD or major depression have an increased risk of developing the disorder. During the winter season, Mainers and college students abroad may begin to feel emotional changes as the weather begins to get colder and our days shortened. We begin to develop some emotional distress similar to depression due to the reduced levels of Serotonin and Vitamin D. If you don’t feel like yourself you may be experiencing Seasonal Affective Disorder. Having low energy–(tired, not wanting to get out of bed, less exercise). Social withdrawal–(wanting to isolate, stay to yourself, not wanting to go out, distancing yourself from others). Overeating–(having anxiety, don’t feel like cooking, eating more as comfort food). Feeling Depressed daily–(feeling sad, unable to express how you feel verbally to others, which isolates you further from talking to friends, family, etc., giving up on routine, just feel like quitting, feeling irritable). We may begin to develop these symptoms as the seasons begin to transition into winter, which makes it difficult to go out and do things. There are many different treatments available for people experiencing Seasonal Affective Disorder. A very common form of treatment is light therapy, or phototherapy. It involves sitting near a light box, which mimics natural outdoor light and causes changes to brain chemicals associated with mood. Light therapy generally begins showing positive effects within a few days to a few weeks and causes few side effects. It is very effective for most people experiencing SAD. People should consider consulting their doctor, however, before purchasing a light box, particularly if an individual has bipolar disorder, as light therapy could trigger a manic episode. Another form of treatment for severe cases of SAD involves using antidepressants, which can help relieve depressive episodes. These antidepressants may take weeks before they become effective and require a prescription from a doctor. Psychotherapy, or talk therapy, is another option for treating SAD. A specific type of psychotherapy known as “Cognitive Behavioral Therapy” can help identify and change negative thoughts and behaviors that make you feel worse. It can also help with developing healthy coping mechanisms and reducing avoidance behaviors associated with SAD. Finally, it can help greatly with managing stress. Mind-body techniques and relaxation techniques such as yoga, tai chi, meditation, guided imagery and music/art therapy can also be very helpful in reducing symptoms of SAD for some people. Simple lifestyle adjustments can also be useful in relieving symptoms. For example, making your environment sunnier and brighter by opening blinds or eliminating anything that blocks out sunlight may help. Getting outside, even on cold and cloudy days can help greatly. Trying to get regular exercise and eating healthy foods can also positively affect your mood to help counteract symptoms of SAD. If you are experiencing symptoms of Seasonal Affective Disorder, don’t hesitate to seek help from a mental health professional. On campus, we have counselor Ralph McPherson who is available to help students. He can be reached by phone at (207) 768-9791 or by email at ralph.mcpherson@maine.edu. Student Support Services can also be reached at (207) 768-9732 or mary.barbosa@maine.edu. County Behavioral Medicine (207) 554-2600. The Northern Lighthouse Inc. (207) 540-1522. Central Aroostook Psychiatric Services (207) 764-9700.